Passport Requirements – What Requirements are Needed to Get a Passport? The passport requirements for a United States of America passport are simple for those who are a U.S. citizen or resident. The requirements vary depending on the age of the applicant and which type of passport is being applied for (passport book and or passport card). Apart from the usual form, one may use when applying for a passport, others may need additional passport application forms. Regardless if it is one U.S. form or more, the same requirements go for everyone. The identifications use as proof of identity are the same for everyone, and need to find an acceptance agent location in your area. If you were born in any of the United States or a U.S. territory, an original birth certificate or an old passport can be used as a form of identification. If you are a naturalized citizen, then the original certificate of naturalization can be used as proof of citizenship. In addition to these primary documents, there are secondary documents which an applicant can used as proof of identity. If the applicant does not have a birth certificate or previous U.S. passport, then other forms of proof can be used, including doctor’s record of postnatal care, baptismal certificate, census record, hospital birth certificate, the early school record, or family bible record. Here is additional information to obtain any of the missing documents may not have to start the application right away. That is if you lost your passport or do not have a copy of your original birth certificate. You can apply separately for any of these documents than for a new passport. How to Renew a Lost Passport? Best Way to Renew a Passport? The documents provided should show date and location of birth and must have been created within the first five years of the applicant’s life. 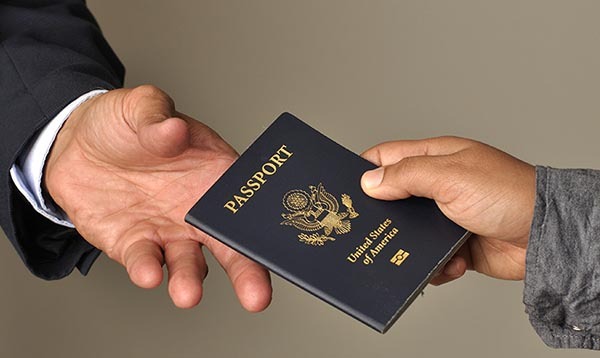 Applicants that were born outside of the United States that do not have a birth certificate or consular report of birth abroad and have only one parent that is a U.S. citizen can use proof of citizenship of your parent, foreign birth certificate, a state issued document indicating that there is no birth certificate on file for you or an affidavit stating all of the locations your U.S. parent lived in the U.S. and abroad before you were born. If both parents are U.S. citizens, then you can bring in their marriage certificate as an alternative to the aforementioned documentations. Minors and first-time adult applicants must apply for passports in person. Adults are considered to be 16 years old and older. Identification and proof of citizenship must be provided, which includes the following forms of documentations: driver’s license, birth certificate, marriage certificates, I.D. card, military I.D. or previous U.S. passport that isn’t altered or damaged. You will need to fill out the proper form and a fee will be required. You can choose between getting a passport book or passport card. Two passport photos will also be needed and must comply with regulations regarding proper passport photo specifications. I am applying for my first passport. I can’t seem to find my birth certificate,but I have my marriage license. Do I need any other identification? as long as you have no pending warrants. Us passport help guide please answer thanks! My daughter is 17 and we are going to get her a passport. She does not have a state ID. We have her birth certificate and I have my driver’s license. Is that sufficent? Hello, is this a first time passport? What name is on your drivers license? If i recently got married and my name on my driver’s license and social security card are in my married name, but my passport is in my maiden name. Do i need to show the marriage license? If so, does it have to be the original? Our’s is with his parents (out of town), but i need to my passport changed for an upcoming Thanksgiving trip. what name is on your current passport and drivers license? The information above mentions two photos that must compl with passport phot regulations, what are those regulations? Do you take photos at the office or reccomend a place near by where I can get photos that comply? The last office I went do was at a univeristy and they did everything in house. If I have been divorced once and then remarried do I need my divorce decree or will proof of my current marriage and original birth certificate be enough? What if I have non-extraditable misdemeanor warrant in another state ? U.S. Passport Help Guide I have several times, and all they say it is processing, just what it says on line too..
My ID was expired and now it’s lost. I’m not living in the current state I last has an ID. Will I be able to use any other form of identification? Suzette Marquez Alvarado what name is on your drivers license? Hello, what name is on your current passport? What year does the passport expire?